There are many traditions that carry over from season to season. Having the leader wearing goggles is so instrumental to the show that Marcus is viewed less fondly for not wearing them (and Taiki thus gains more respect for honoring his roots). At least one enemy must redeem themselves and become an ally. And Leomon, or some variant of Leomon, must die. 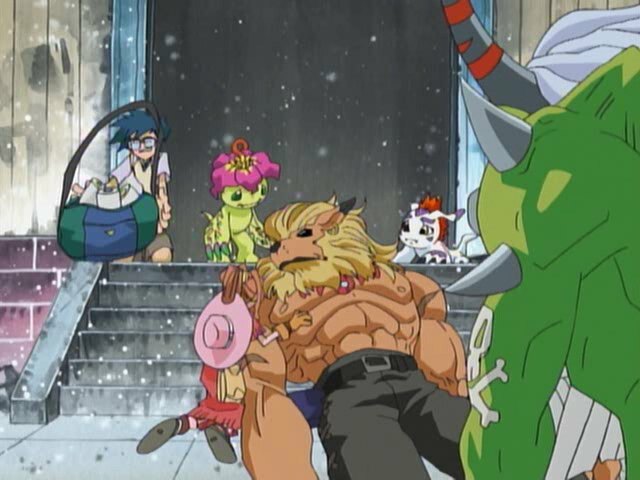 There's something very perverse about Leomon's death turning into a franchise tradition. It's not like he's some bumbling fool that comically ends up at the wrong end of a battle. This is a badass symbol of nobility and justice. While he usually maintains that (making his deaths all the more tragic), there have occasionally been moments where he's shoved on screen and offed like Kenny from South Park. Even here, the title is named after his arch rival... who doesn't really do a whole lot. In a vacuum, however, it's pretty heart-wrenching to watch. 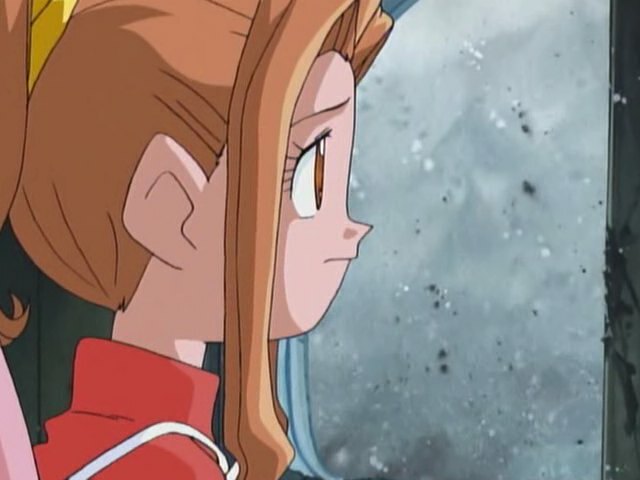 Given the context that Mimi's desperately trying to distance herself from all the violence, in terms of emotional impact it's closer to Tamers than you'd think. In this mini-arc that's mostly about her (when not dealing with all of Matt's angst), she reaches her lowest point. 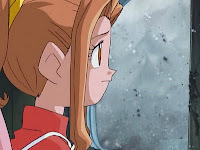 When MetalEtemon finds them at the ruins of Digitamamon's restaurant, Mimi freezes completely, even when Leomon gives them a chance to escape. She rushes into the battlefield to stop the injured Ogremon from fighting, leaving her open to attack. SaberLeomon takes the hit and it's yet another death. At least Joe is equally distraught and recognizes that all these sacrifices are no less significant. He's even angry that the supplies he brought mean nothing in the grand scheme of things. It's ironic that Leomon's death in Tamers is the beginning of the trauma for Jeri, while Leomon's death in Adventure marks the transition out of it for Mimi. When she learns that Primary Village won't be restored until the Dark Masters are defeated, she realizes that there's nothing to gain in running away. Plus with Ogremon joining the team (or, as he puts it, sticking with them since they're going the same way), they can recruit Digimon allies, such as the Gekomon and Otamamon from Princess Mimi's entourage. It's ultimately a step forward rather than a step back. The biggest step forward, of course, is Puppetmon's defeat. 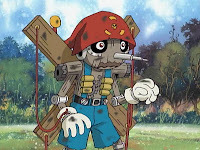 With Deramon and Floramon having a blast firing cannons at him from inside the house, Puppetmon scares them off and draws Team Xros Heart right into a RedVegiemon ambush. They have no trouble dealing with them. Despite taking control of WarGreymon, Puppetmon ends up stuck without his hammer facing him, three Ultimates and Angemon. So naturally his house transforms into a giant robot and attacks them while he tries making a break for it. Funny how the house is quite possibly stronger than any Digimon encountered thus far, other than VenomMyotismon. Perhaps. What follows is Puppetmon in a nutshell. He escapes easily enough, but questions how it's possible that he could be losing. He then promptly eliminates one of his RedVegiemon minions trying to retreat as well. Suddenly, he's out of allies and face to face with Team Blue Flare. Puppetmon treats Matt and MetalGarurumon as minions and orders them to join the battle he had just left, completely ignorant of the subtler aspects of Cherrymon's approach. To him, they've just joined his side, and it isn't more complicated than that. It is, and one shot from MetalGarurumon proves it. Sora sees Matt and thanks him, but he's not done brooding yet and leaves. Again, it's complicated. One victory doesn't solve a whole lot. In a nice touch, Palmon uses her vines to grip SaberLeomon as they ride away from MetalEtemon. Leomon presents some really wild theories about the adventure thus far, including that Devimon was a mere test for the digidestined to prepare them for the Dark Masters. Given that Devimon never specified his exact motive the way other villains had, it's an interesting proposition, especially with Devimon's death speech and his two main servants becoming good guys. While it explains MetalEtemon's newfound invulnerability, the “chrome digizoid” battle banter between him and Zudomon is really tacky. If you think someone or something being made of chrome digizoid is important, I've got some mithril armor to sell you. There's a different song playing when Puppetmon is defeated. It's called Change Into Power and I have absolutely no memory of it. Devimon is definitely a wild card. Depending on who you ask, Devimon is either a bad guy who enjoys messing with other bad guys as much as he does good guys or a greater threat than originally thought.